We now have a massage therapist! Call today for an appointment! Come check out our new merchandise featuring clothing lines by Origami, Urban Mangoz, and now carrying Sparkle Pop Jewelry. We now provide wi-fi hot-spots! So bring your notebook computer and surf the web while you wait! "Great hair color is an art. So, get out of the box and into the hands of an artist!" Reflections by Sissy & Co.
At Reflections by Sissy & Company, we provide our clients with professional service in a relaxed, comfortable atmosphere. We use only the highest quality products and take great pride in our customer's satisfaction. Full salon services include haircuts, styles, Goldwell Inner Effect treatments, Goldwell color and dimensions, permanent waves and relaxers, complete manicure and pedicure services. 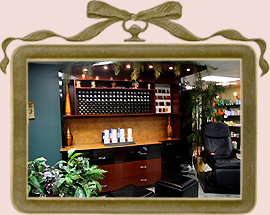 We also perform permanent cosmetics, Microdermabrasion and Repechage facials, waxing, body wraps and body scrubs. All procedures by Reflections by Sissy and Company are done with a complimentary professional consultation first, to better meet your individual needs.